Econ 101 tells us that if you want to reduce emissions of a pollutant, the most efficient way to do that is to put a price on emissions, so that all possible routes to reduction are taken, and the marginal cost is the same for all routes. It’s a real insight, and has had positive impacts on real-world policy — cap-and-trade has worked very well at reducing acid rain. The point is that just because Econ 101 makes a smart, counterintuitive point doesn’t make that point of central importance…. Yet, we know ex-post from acid rain cap and trade plans that cap and trade regimes deliver results. And we also know that regulatory capture undermines many anti-pollution rules with solar being among the biggest targets. Next, there is the fact that massive amounts of Carbon Pollution remain unaccounted for. So both market making and regulation must be moved forward deliberately. Evidence continues to mount. The time for a rapid transformation away from Industrial Agriculture methods towards Sustainable ones is now. The size of an hypoxic ‘dead zone’ that disrupts and destroys marine life and fishing lifeways in the Gulf far exceeds this year’s forecast, NOAA scientists report. The dead zone — areas in red to deep red that have far too dissolved oxygen to support marine life other than often toxic algal blooms— is the size of Rhode Island and Connecticut combined. The Gulf of Mexico’s “dead zone,” a region depleted of oxygen to the point where fish and other marine life can die, covers 6,474 square miles this year, federal scientists say. That is above the yearly average and much larger than had been forecast for 2015, the National Oceanic and Atmospheric Administration says. A “dead zone,” also known as an hypoxia area, is the result of the runoff of nutrients from agriculture and other human activity carried by rivers into the ocean. There, those nutrients accelerate an overabundance of algae that then sinks to the bottom where it decomposes, consuming the oxygen needed to support marine life, the agency explains. This year’s dead zone in the Gulf is the size of Rhode Island and Connecticut combined, scientists say, with nutrients flowing from the Mississippi River affecting coastal resources and marine habitats in the Gulf. the latest facility under the Bacardi umbrella to produce energy through a biomass boiler fuelled by Scotch whisky distillery by-products. The Dewar’s facility produces enough energy to power entire communities of neighboring distilleries — along with about 8,000 homes….We generate 8.3 megawatts of electricity every hour of every day. We use some onsite and export the rest — enough for 20,000 people in 8,000 homes,” said Frank Burns, Managing Director at Rothes CoRDe….Converting pot ale (the residue from copper whisky stills) into organic feedstock is another technique used to divert waste from the distilleries. Local farmers use it for their animals. Each of these initiatives helps the company get a little closer to creating a “closed loop” lifecycle for their whisky products. As oft-noted here before, sustainable business practices and principles are not a fad or fringe aspect of modern management and fiduciary practice. Rather, they are essential for planning for long term success in the 21st Century. Recently the standard taking point for climate science deniers regarding manmade climate disruption has been ‘I can’t say, I am not a scientist’. This no doubt thoroughly focus-grouped response is the equivalent of saying ‘I can’t say if smoking causes cancer, because I am not a scientist’. Yet here is Pope Francis, who also happens to have scientific training and work experience in chemistry, preparing to release an encyclical saying that climate change is real, mostly manmade, will primarily hurt the world’s poor, and represents a moral obligation for Catholics to take steps to combat. But I think religion ought to be about making us better as people and less about things that end up getting in the political realm. The papacy of course has been involved in politics, sometimes for better and some for worse, since the founding of the church. Certainly many Catholics reference the papal edicts regarding abortion and marriage. And many great scientific discoveries and proofs come from monks and those who considered themselves Christian, such as Gregor Mendel, Pope John XXI, Copernicus, Galileo, Kepler, Newton and Boyle. About 69 percent of adults say that global warming is either a “very serious” or “somewhat serious” problem, according to a new Pew Research Center Poll, up from 63 percent in 2010. The level of concern has still not returned to that of a decade ago; in 2006, 79 percent of adults called global warming serious….One small exception on climate change is that Catholic Republicans are slightly more concerned about climate change than non-Catholic Republicans, although the gap is small: Most Catholic Republicans are also skeptical that human activity is heating the planet. Christmas Tree of Recycled Plastic Bags made by artists Luzinterruptus. Solar and wind energy are now price competitive with conventional fuels and installations, especially in the Northeast and Southwest. The US military maintained its tremendous foresight as it advances with solar installations as well as developing equipment for the field. Stock traders have been bullish (though recently skittish to bearish). Nonetheless, the Guggenheim Solar ETF (NYSEARCA:TAN) vs. the S&P 500 showed huge swings to the upside again marked by very high volatility. Observations that low oil prices will harm solar lack coherence as the main competitor to solar and wind is coal in the world’s energy marketplace. Furthermore oil accounts for less than 10% of the input costs of solar manufacturing and de minimus amounts in plants presently online. Divestiture from fossil fuel concerns now stretches from the offices of the Rockefeller Foundation to those of the Stanford University endowment, among a great many other institutions. In other areas of finance, firms like Generate Capital have rolled out innovative methods for providing capital for renewable energy and fresh water infrastructure. Challenges lie ahead in 2015 to be sure. Many states such as Ohio and Florida are rolling back programs to encourage adoption of clean energy. The incoming U.S. Congress will be controlled by policymakers quite hostile to climate change mitigation, clean energy, and the EPA. Worse still, they are more committed to corporate welfare for the fossil fuel industry than ever. While jobs have been created (and destroyed) in the boom-bust cycle of shale extraction, in a handful of states the notion of the industry undertaking retraining assistance is never mentioned. Thus any hope of 21st Century Public Works project to build our climate friendly infrastructure hinge on the outcome of the Presidential election some two years out. ….even though I felt (and still am convinced) that gas extraction from shale can be done safely and cleanly if properly regulated. In our current environment regulatory capture — the revolving door between regulators and the industries they are tasked to regulate by the electorate — continues to intensify. So expecting ‘proper regulation’ to protect our water supply and atmosphere is an inviable approach in the Citizen’s United era. (As an aside Journalists Charlie Rose and Cory Johnson, both of Bloomberg TV, have recently professed ignorance as to what regulatory capture is. Yet, its well known many key regulators are paid bonuses to leave their jobs for government all the while expecting to be hired by the same industry that they regulated. Who is going to regulate and fine firms for which they expect to work?) Quis custodiet ipsos? Utility scale solar in particular presents legitimate concerns due its water requirements for keeping sand and dust off the panels. Though as the World Bank notes many Concentrated Solar Power plans have managed to cut water usage by 90%. Nonetheless, fossil fuel is still the primary threat to supplies of fresh water, whether from fracking, coal mining, or aquifer depletion. Rampant plastic pollution injures our hydrosphere and climate change continues to change the ecology of the world’s oceans via acidification. Such changes are dangerous, and the one’s still under study are worrisome in the uncertain nature of their long term effects. Meanwhile confusion and weak logic reign when it comes to the Keystone XL pipeline. Economist John Cochrane calls it “infrastructure” yet its only purpose is to ship oil from Canada for export and usage in other nations. And, the profits will largely accrue offshore. The hope is that the President will veto this boondoggle — which will create comparatively few jobs, the majority of which will be temporary. However, it is worth ending on a positive note. Increasing numbers of people recognize the threat of climate change and are integrating ecology into economy. The picture at the beginning of this post is one of a Christmas Tree made entirely of recycled plastic bags. A realization is spreading that the natural world, the source of all life and profits, needs to be given as high a priority as national defense for it is essential to the general welfare. Robert F. Kennedy presents a strong case that King Coal is by and large criminal given the massive amounts of regulatory violations and thus damage to local water, air, and geologic resources it wrecks. To this all one must add coal mining concerns’ repeated and ongoing attempts to mislead and falsely report low to no violations of numerous federal and state laws. As usual several commenters complain about loss of jobs caused by efforts to restrict and ultimately ban strip-mining. Oh, and subsidies for renewable energy are bad. These arguments are nothing more than a bunch of hot, soot-filled air. Most mining has been automated over the last decade or so — by the coal mining concerns (which receive tax subsidies and other benefits themselves). 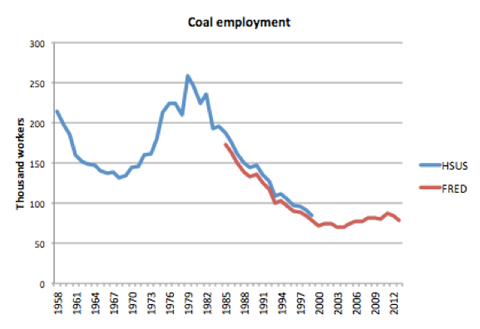 So we’re talking about very few jobs — that King Coal would happily eliminate if it could. They should be required to pay for re-eduction/re-location for miners as opposed to plying the line that its a choice between jobs and clean water, air, and intact forests. Its not, at all. Noting that Sandy caused extensive damage to the state’s energy infrastructure, the BPU said that distributed energy resources, including combined heat and power, fuel cells and off-grid solar inverters with battery storage, allowed some critical facilities, including hospitals, to remain operational while the electric grid was down. Launching the ERB will allow more such facilities to remain operational during future outages. Solar Microgrids continue to come online across the United States as well as across the world. Several factors drive their emergence: addressing carbon pollution, the need for uninterrupted power supply during severe weather and other crises, and the need for low-pollution, accesible power in remote areas. Diesel fuel after all must be shipped in. Another popular feature in urban areas is the ability to sell spare power back to the grid. This is a feature consumers love but many utilities resist. And they are now on the march to charge distribution fees to consumers that generate power for the grid. Nonetheless, many states are moving to scale back renewable energy support (curiously while leaving fossil fuel subsidy and policy support in place). So there is a long way to go for the U.S. to gain energy independence and ensure that our air and water supplies are safe for future generations. We honor the sacrifice and dedication of the women and men of the United States Military. The Fund Balance team takes great reassurance from their collective recognition of the realities and risks for our shared peace, security, and prosperity posed by climate change. The US Military’s determination indicates the urgency for a steady, determined transition to green and renewable energy sources. Its organizational and technological expertise as comprised of active and former service members will play a singular and essential role in planetary deployment of renewable fuels. Leadership in delivering renewable energy and power in the 21st century on mission-critical scales will help us all avoid economic, social, and ecologic entrapment by the carbon-intense fuels of the 20th. We urge our elected representatives to continue to support the United States Military in these efforts. What explains the sharp decline in U.S. employment from 2007 to 2009? 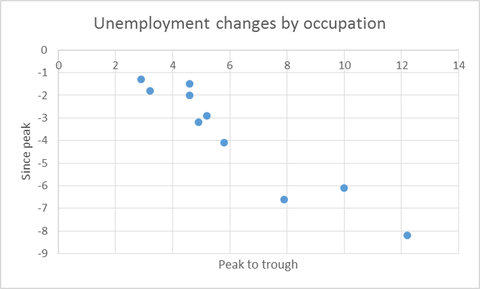 Why has employment remained stubbornly low? Survey data from the National Federation of Independent Businesses show that the decline in state-level employment is strongly correlated with the increase in the percentage of businesses complaining about lack of demand. While business concerns about government regulation and taxes also rose steadily from 2008 to 2011, there is no evidence that job losses were larger in states where businesses were more worried about these factors. The LED lighting market is hot and very competitive. From relative newcomers like Cree, Acuity Brands, and OSRAM, to well-known brands Koninklijke Philips and GE Lighting, the fight for market share is intense. Growth potential is high. We project the LED market’s CAGR (compound annual growth rate) around 45% through 2016. Consequently, risks of oversupply and subsequent profitability declines in the face of downward price pressures bear watching for investors in smaller firms and/or firms with slim margins. One of the key factors contributing to this market growth is the declining Average Sales Price (ASP) of LEDs. The global Chip on Board LED (COB LED) market has also been witnessing the increasing demand of COB LED in general lighting applications. However, fluctuating global economic conditions could pose a challenge to its CAGR, as well. The key vendors within the COB LED market space are Citizen Electronics Co. Ltd., Cree Inc., Nichia Corp., Osram Opto Semiconductors GmbH, Philips Lumileds Lighting Co., Samsung Electronics C o. Ltd., and Seoul Semiconductor Co. Ltd. LED product ASP drops have contributed largely to increased consumer usage. Current payback time for commercial luminaries A19 and PAR28 has already been reduced to a year or less while LED bulb price has room to drop 30 percent by 2015. Penetration rate in 2013 will reach around 11 percent up over 5 percent last year, projected at LED 20 percent before 2015. The LED lighting market is more dispersed than the LED backlight market where consumers are highly concentrated. The top three global lighting manufacturers Philips, Osram, and GE make up 30 percent of the global market share. This dispersed nature of the LED lighting market will bring more revenue and bargaining space than LED backlight products in the past. This is sure to attract more consumers to replacement LED bulbs via its economic and ecologic benefits. Specifically we see LED lighting market development trends and lighting product strategy and the market share situation in different areas. 3030 LED has highest lm/$ and is widely distributed in the market and most preferred. LED Manufacturers will continue to speed up COB product development. Revolution Lighting Technologies (RVLT) is a firm emblematic of the wider LED narrative for new entrants. With revenue of $15 m, net income loss -S19.53m and their market cap is $259.96m the market for their shares appears way ahead of itself. Yet this new firm is wisely using its pricey stock to make acquisitions to challenge bigger players with market caps measured in the billions of USD. Sales momentum proceeds unabated. New York’s largest commercial property company, SL Green Realty (SLG) is one of the company’s key customers. SL Green has awarded two orders this year – an order for 1,000 LEDs for a Times Square commercial property in March followed by an 8,000 LEDs order in December after large purchases in 2012. RVLT started 2013 with an acquisition of California-based LED solutions provider, Seesmart Technologies for $20 million. Revolution’s bankers liked Seesmart’s distributor count of more than 50 and potential project value exceeding $1 billion. As one of the smallest players in the industry, RVLT’s exposure to any potential price war could hurt the already vulnerable stock value. And, signs of one are already visible, with both Cree and Philips now offering sub-$10 LED lamps. As prices fall, RVLT has few good options but to follow suit, which will directly hit its strong gross margins from 2013. As awareness about energy efficiency ever-growing in nations across the globe, the LED lamp investment thesis has great prospects. RVLT may be well poised to capitalize on these trends. But, with nil profits and cash flows, shareholders need to be wary of dilution from additional equity issue to raise capital for funding growth. In sum, at the outset we thought that valuation was fanciful for the long and mid-terms and still do which is why we did not add it to our Leading the LED Motif over 2013. Though we did miss the tremendous upside in 2013, we think the fundamentals make the probability of a pullback in 2014 very high and a strong sell-off not unlikely. Fund Balance sees excellent opportunities in the private equity, early stage space LED manufacturers. One start-up firm we work with closely projects $19 mil net income in its first year. Our Year 3 sales are projected to be $19 mil with net income of $700K on a $ 2.5 mil raise. Light-emitting materials will encounter rapid change in 2014. From Smartphones to touchscreens they are key to the future of human-computer interaction. These materials are consistent with sustainable investment and business development goals as these materials consume less power than standard LED products and share in the durability. Active matrix organic light-emitting diode (AM-OLED) entered the display panel market when Samsung Display started operating its large-scale mass production facilities in 2008. Since then, Samsung Display has been the leader in the AM-OLED market expansion. In particular, AM-OLED displays have been well received by smartphone manufacturers, achieving noticeable growth in products ranging from the high end of 3 inch to 4–5 inches. By 2014, Samsung Display but also LG Display, AUO and Japan Display Inc. (JDI), are set to boost AM-OLED panel production or initiate mass production. Given that, light-emitting material makers are expected to compete in a more advanced market environment with increased demand and a broader base of customers, after the first part of this decade where they had depended wholly on demand from Samsung Display. In 2013, the AM-OLED light-emitting material market stood at around $350 million based on demand from mass production lines. In 2014, the market size is forecast to rise by about $100 million to $450 million thanks to demand growth from the existing and new AMOLED mass production lines. The LED/OLED market will grow and expand in 2014. Opportunities will abound for established markets and technological innovators that can compete on price and power consumption reductions. The Fund Balance Leading The LED ETF outperformed the S&P, and we are not currently looking to make additions or rebalances, though we will continue to look closely at start-ups and monitor industry wide ASP trends. Note: This is an Excerpt from the Fund Balance 2013 Review/2014 Outlook — Section III: Solar Stocks 2014. One of the most widely held ETFs, the Guggenheim Solar ETF (TAN in the chart above), returned 131.3% YTD and –54.96% over the last 5 years. Solar power investments performed tremendously in 2013. Commercial users of solar power such as Walmart, GM, Staples, and Walgreens are just now scratching the surface of what is possible in terms of balance sheet energy cost saving and carbon footprint reductions. Current installed solar production is minimal compared to overall energy consumption, though a paucity of data which is closely held by most suppliers and users, makes gauging returns on capital and cost efficiencies inexact. From an asset management point of view, as the solar power industry matures buying opportunities become more difficult to spot. We urge growth investors to hold and build positions in companies with long term stable cash flows and to keep some powder dry for nascent prospects in smart-grid, storage, and supporting software and services such as Power Secure International which returned ~130% in 2013. Investors with short time horizons are advised to explore capturing some profit in the first quarter of 2014. As 2014 unfolds, potential interest rate increases from reduced monetary stimulus as well as policy uncertainty stemming from upcoming expiration dates for tax credits early in 2016 will guide discrimination between long term positions and short term ones in solar power. New solar Photovoltaic (PV) installations grew at a rapid pace in 2013 to 36 GWs. The cost competitiveness of this electric power source shows rapid improvement as well. While utility-scale PV installations are not yet cost competitive with fossil fuel power plants, commercial-scale installations have attained cost parity in that generation costs of power from solar PV is comparable to the retail electricity prices that commercial users pay in key economic regions. In the US, demand will continue to pick up in 2014. Still just 5 states have 82% of all US solar installs. In immature markets in the Southeast, with Georgia showing leadership in both its initiatives as well as its withdrawal of tariffs, which are still in place in other states. We see large opportunities here. Their tariffs on solar generation amount to a penalty on home based solar power generation while voters and stakeholders are taking notice. Leading markets in the Northeast and Western United States remain robust and highly competitive. Hawaii also has stuck with its plan for widespread solar usage in order to wean itself from fossil fuels for residential and many types of commercial power. All of this reinforces a key trend: Over 2014 consistent growth will continue as the cost of solar comes down and the cost of other energy sources goes up. California continues to lead the solar PV charge, installing 455 megawatts in Q3; North Carolina moved into the No. 3 spot in total PV installations with 23 percent growth. Nevada moved from 17 to 5 and Vermont from 21 to 12 in the rankings. Commercial-scale installations could reach ‘‘grid parity’’ in about ten years, if the current federal tax incentives for solar power were to expire at that point rather than sooner. Impact investors should look to solar stocks in 2014 that are performing well at its outset. Fund Balance expects a continuance of 2013 trends in the near and mid-term. The same can be said for the broader array of underlying macroeconomic conditions. Throughout 2014 demand driven by system prices will slow somewhat after market absorption of significant 2013 price reductions on the heels of the industry wide buffeting in 2012. Price stability helped solar market growth while capacity and supply shrunk as companies went out of business (Suntech Power and LDK Solara are two examples). Demand however steadily picked up. A long awaited EU-China solar trade agreement bodes well for international price stabilities. Chinese manufacturers are not signaling plans for expanding or upgrading solar plants until at least 2015 as even its best manufacturers continue to shrink bloated balance sheets. As Chinese banks appetite for solar risk subsides after the three voracious years shrinks, we expect steady mostly unchanged supply levels from China in 2014. In the a US in 2013, increasing demand for solar power and stable pricing in the second half of 2013 provided strong support to manufacturers. Once struggling to break even, SunPower (NASDAQ: SPWR), Canadian Solar (NASDAQ: CSIQ), JinkoSolar (NYSE: JKS), and Trina Solar (NYSE: TSL) are now profitable and richly valued. Trends look in their favor though volatile short interest is high. Has the market priced this trend into their asset prices and valuations? Overall then, gross margin trends over the past year for these companies improved rapidly as a result of the aforementioned better pricing as did cost reductions from 2012 when the industry was in a far worse position. If demand hits many analyst’s upper range of 46 GW in 2014 and as little new capacity is scheduled to come online in 2014, these growth trajectories will continue upwards. For example, SunPower’s 350 MW expansion will not come online until 2015. Margins for producers with scale will continue to improve and sustain market valuations albeit attached with worries of irrational exuberance. The highest quality suppliers have seen the biggest benefit so far and we think that is where the gains will be this year as well. We think the smart bet is on a profitable company making even more money as the industry improved than a high risk debt ridden company turning things around. In 2014, higher economic growth rates with inequality effects via persistent constrained spending power of the US consumer will exact a noticeable fiscal drag in the US, while positive developments from 2013 in US equity markets are mostly priced into valuations and a correction should be on investor’s radar screens; uneven growth will be the trend in the EU; China addresses banking and credit market instabilities; the developing world sees demand for its resources continue to grow. Uncertainty around regulatory and tax policy will impact markets less than opacity about public sector investment levels. Absent exogenous geopolitical shocks, US investors should expect continuity in build up of momentum from 2013 into 2014 but with more volatility, sideways directionality, and perhaps a correction. This momentum will be further dispersed via diminished purchasing power for US consumers whose wages are not reflecting the wealth effects seen in asset price surges or low interest rates available to the luxury class and blue-chip corporations, and so will not be able to fully participate in robust economic activity. Minimum wage gains will not impact the economy meaningfully until 2015. At the outset of 2014, the expiration of long-term unemployment insurance in US is predicted to shave .3% off the US economy according work by Mark Zandi, Robert Schiller, and others. Home price increase rates are slowing. This can be seen as an example of the velocity of money, or M2V, from the invaluable St. Louis Federal Reserve’s datassets and tools. M2V Stocks indicate persistent decreases in economic transactions in the US Economy. Note: The velocity of money is the frequency at which one unit of currency is used to purchase domestically- produced goods and services within a given time period. In other words, it is the number of times one dollar is spent to buy goods and services per unit of time. If the velocity of money is increasing, then more transactions are occurring between individuals in an economy. Source: Federal Reserve Bank of St. Louis. The broader energy market will continue to be characterized by abundant LNG, tight oil, the arrival of renewables as key components of the US energy mix meaning self-sufficiency for North America and making it a more attractive place to invest. Upward pressure on the USD will be counterbalanced by low interest rate biases for at least the first two quarters. Yet, here again is a bright spot, as we point out in our solar section and broadly speaking for the sustainable category, falling prices for renewable energy and green consumer goods which provide very significant, if mostly overlooked benefit, to an ever larger percentage of the US population. Companies that focus on smart cost cutting with renewable energy, investing in product and market research, hiring new people, and advocating for smart regulation aimed at targeted reductions of dependency on fossil fuels will be poised to benefit their investors into 2015. All the while acting in the best interest of their respective nations and as good corporate citizens. Asset markets have positive price momentum at the threshold of 2014. That momentum helps identify assets that are performing well now. Conditions and measures indicate that the underlying trends for these specific subsets of these assets will continue into 2014. Our analysis also comports with the findings of the Pew Foundation: acute income inequlaity negatively impacts economic growth. Like the hangover from sugar rushes, ambient toxicity is the result of short term economic choices that ultimately sacrifice the long term resiliency of economies’ basic foundation, our shared ecology. Global financial markets posted mixed performance in 2013. Gains in US were offset by mixed performance across Europe, Asia, and other Emerging Markets. Technology IPOs including Twitter posted strong gains while US corporate fixed income issuance remained robust in continuance of 2012 record levels. Broad-based US equity gains were led by technology, renewable energy, healthcare, and small caps, offsetting weakness in Fossil Based Energy, REIT and commodity-sensitive assets. In Europe equities posted mixed performance, with gains in Germany, Sweden, and the Netherlands offset by weakness in the UK, Italy, and Russia. Asian equities were also mixed, where strong gains in Japan, China and Hong Kong were countered by weakness in Australia, India and the Philippines. US yields rose across most maturities on the improving US economic outlook. Curtailment of US Federal Reserve stimulus efforts now seems imminent by 2016 even with the Fed’s plan to measure tapering bond purchases with continued downwards tweaks on interest rates. European yields were little changed following recent ECB policy action of lowering rates. The US dollar posted mixed performance, gaining against the Japanese Yen while falling against the British Pound Sterling. The Dollar was little changed against the Euro though this could change if interest rates in Europe fall on expected enduring faiblesse. Though we believe the contrarian case that France will surprise on the upside in terms of economic strength. The Dollar’s strong gains against Emerging Market currencies including the Indian Rupee, Australian Dollar and Brazilian Real may be partially responsible declines in metals and commodities. Moderating expectations for inflation will ensure fixity for this trend of modest declines into 2014 across silver, aluminum, gold and platinum. Recent sharp gains in LNG will moderate somewhat in 2014, but we do not foresee the beginning of a bust cycle in the US until at least 2015. These is due to continued expectations of tight oil combined with economic growth and lower costs for feedstock. We expect more pressure to be exerted on developing nations to extract resources with little regard for the well being of their natural capital, i.e. fresh and and clean water supplies, as they race to build out electricity infrastructure and earn export income with international trade. We expect pronounced volatility for oil as political developments to ease sanctions in Iran impact its price which in turn will drive increases in US natural gas exports. Agricultural commodity gains were led by soybeans, rice and coffee, which were offset by declines in sugar, hogs and corn. Hedge funds gained in late 2013, with a November 2013 gain in Global Hedge Fund Index (HFRX) posting a gain of +0.55% for month, while the HFRX Absolute Return Index rose +0.45%. In 2013 much was made of so-called policy uncertainty, yet the fiscal cliff met with a collective shrug from the world’s markets, despite public hand-wringing on the part of US creditors nations such as China. Fund Balance does not see impending consequences for policy uncertainty in bond prices and in the stock market. Nor are entrepreneurs demonstrating a reluctance to invest due to lack of clarity regarding future tax and regulatory events. If such uncertainty was so grievous, liquidations by entrepreneurs of their current stock positions for a song should be the norm, and they instead shift assets to the Cayman Islands and the like. Thus, under hypotheses invoked by austerians and bond vigilantes, one would expect the stock market to be low when uncertainty regarding government policy is high while the opposite was true in 2103. Furthermore, this internal logic would entail expectations of interest rates on government bonds trending high as well since one way uncertainties about future policies get resolved is via inflation. The markers that would indicate that enterprise was being hobbled by uncertainty about government policy per se—those markers just are not there. This seems to me to be a side issue—another argument that is based on political wishes rather than on economic evidence. A Note on the Role of China in Relation to the US Economy. The Peoples Republic of China faces the self-imposed generational challenge of moving over three million people a year from subsistence farming in the countryside to industrial and service employment in the cities. Apart from the questions of how to integrate sustainability into this process, consistent with sustainable investment goals, how might this impact their appetite for US debt? The only way to do this is to purchase U.S. government bonds so that the Bond sellers will have renminbi which are used to buy exports from China. That approach involved the central bank’s turning to posts on China’s Twitter-like social messaging service, Sina Weibo, to chasten banks to “make rational adjustments to the structure of their assets and liabilities, and improve their liquidity management using a scientific and long-term approach…. While policy makers say they are worried about upsetting the delicate mechanisms of the current banking system, public criticism continues to grow, even within China’s elite. That suggests further market-oriented experiments could be coming soon. Fund Balance holds that increased inequality in the US economy, 70% of which is comprised of consumer spending will continue to be a drag on sustainable growth in 2104. Moreover, can the US economy remain vital and growing in the face of inequality and its doppelganger, automation? Oxford researchers found that 45 percent of America’s occupations will be automated within the next 20 years implying that nearly half of U.S. jobs are vulnerable to computerization. It’s the same as the geographical story: the occupations that took the biggest hit have had the strongest recoveries. Still, rapid advances in technology do represent a serious potential threat to many jobs historically performed by people. Google’s Eric Schmidt eerily talks of humans needed to prepare to compete with machines for jobs as the firm has been on an acquisition spree for robotics firms. A recent report from the Oxford Martin School’s Programme on the Impacts of Future Technology attempts to quantify the extent of that threat. It concludes that 45 percent of American jobs are at high risk of being taken by computers within the next two decades. The authors expect this replacement in two phases. First, computers begin to replace in vulnerable fields like transportation/logistics, production labor, and administrative support. Jobs in services, sales, and construction sectors may also vanish in this first phases. Then, the replacement rate will decelerate due to bottlenecks in harder-to-automate fields such engineering. This “technological plateau” will precede a second wave of computerization, driven by deep learning. Systems derived from these innovations will compete for jobs in management, science, engineering, and the arts. They conclude that the rate of computerization depends on several other factors including regulation of new technology and access to cheap labor. Our findings thus imply that as technology races ahead, low-skill workers will reallocate to tasks that are non-susceptible to computerization—i.e., tasks that required creative and social intelligence….For workers to win the race, however, they will have to acquire creative and social skills. Established estimates are that one in four private-sector jobs in the US now pays less than $10 per hour, well below a standardized living wage for the US. Compared to better-paying positions, these jobs rarely feature regular schedules, health care coverage, paid vacation time or sick leave — the essentials of middle-class work. In other words, employment increasingly is not a guarantee of life above the poverty line in the US. Indeed, according to census data, more than one in 10 Americans who work full-time are still poor. THE Intergovernmental Panel on Climate Change reported in September 2013 that it is “extremely likely” that human activity was the dominant cause of global warming or about 95 percent certain — typically the standard of rigor in scientific accuracy. Accordingly, in 2014 the principle that environmental and development issues are inseparable from business will continue to integrate with global commercial and social functions. Impact investing in 2013 was characterized by a sense of urgency for adapting precepts of wealth creation and stewardship to 21st century realities. This matched up with the year’s abundant, rational exuberance in asset markets. We expect a cautious optimism to persist in 2014 though much of the reality based upside from 2013 is likely already priced into market values. A correction then should not be ruled out, and those with short term objectives should consider capturing some profit. Looking further ahead, markets and society will increasingly reject notions that a Faustian bargain holds between employment and shared prosperity on the one hand and fresh air and healthy water supplies on the other. There is, of course, more work to do. It became clear to many in 2013, in Shanghai, China for example, that regions with little to no regulation of pollution suffer poisoned water, air, and thus economic inefficiency. Wholesale deregulation of energy extraction then are at best short term fixes to long the term economic challenges of mitigating climate change and renewable resource stressors within the context of exploding energy demand across the globe. More troubling news issued from China at the turn of 2014 where the results of the world’s largest natural experiment in unsustainable economics are coming in, and they are nothing short of tragic. An alarming glimpse of official findings came on Monday, when a vice minister of land and resources, Wang Shiyuan, said at a news conference in Beijing that eight million acres of China’s farmland, equal to the size of Maryland, had become so polluted that planting crops on it “should not be allowed.”…. One-sixth of China’s arable land — nearly 50 million acres — suffers from soil pollution, according to a book published this year by the Ministry of Environmental Protection. The book, “Soil Pollution and Physical Health,” said that more than 13 million tons of crops harvested each year were contaminated with heavy metals, and that 22 million acres of farmland were affected by pesticides. Given the above outcomes and outlooks we share the that view bringing electricity to developing nations is a key goal for sustainable economics for a host of reasons. Xi Chen and William Nordhaus have found that luminosity is a strong predictor and proxy of economic growth rates. As GDP per capita rises quality of life improves and more often than not environmental degradation lessens. Fund Balance sees such considerations as essential for economic planning and maintenance in the US and EU as well. There is, of course, more work to do. It became clear to many in 2013, in Shanghai, China for example, that regions with little to no regulation of pollution suffer poisoned water, air, and thus economic inefficiency. Wholesale deregulation of energy extraction then are at best short term fixes to long the term economic challenges of mitigating climate change and renewable resource stressors within the context of exploding energy demand across the globe. More troubling news issued from China at the turn of 2014 where the results of the world’s largest natural experiment in unsustainble economics are coming in and they are nothing short of tragic. A signal moment came in May, when officials in Guangdong Province, in the far south, said they had discovered excessive levels of cadmium in 155 batches of rice collected from markets, restaurants and storehouses. Of those, 89 were from Hunan Province, where Ms. Ge farms. Given the above outcomes and outlooks share the that view bringing electricity to developing nations as a key goal for sustainable economics for a host of reasons. Xi Chen and William Nordhaus have found that luminosity is a strong predictor and proxy of economic growth rates. As GDP per capita rises quality of life improves and more often than not environmental degradation lessens. Fund Balance sees such considerations as essential for economic planning and maintenance in the US and EU as well. With these principals in mind we look back on the Fund Balance practice in 2104 and its plans for 2014. The Fund Balance Équilibre Impact Investing Market Index returned 51.1.% in 2013 with 167% over 5 years compared with 31.8% and and 128.% 2 for the S&P respectively. Equilibrer is composed of stocks whose prices have mostly risen over the the past 12 months. While it has yet to achieve fixity in terms of its constituents, it serves as a proxy for us of a basic large-cap market tracking index like the S&P 500. While the Dow Jones Sustainability World Index (W1SGI in the charts above and bel0w) returned 19.7% YTD and 69.12 over 5 years. A promising development in the calibration and refinement of impact and sustainable investing and capital stewardship: in 2013 Fund Balance will also be utilizing Climate Counts rankings which put companies’ self-reported emissions data in the context of GHG reductions called for by climate scientists while scaling this assessment based on market share. Researchers Bill Baue, Mike Bellamente, Mark McElroy looked at factors such as emissions output and contribution to GDP to assign a company-level carbon budget in determining whether reported emissions are on track with science-based thresholds. Setting aside questions of Sustainability Indices, talk of bubbles have featured prominently in market analyses. An integral part of energy market analysis and policy planning increasingly requires careful attention to unburnable carbon. The concept has occurs with increasing frequency, including a much discussed article in the Financial Times, as well as in the growing literature of sustainability investing. Although bubbles are best seen in retrospect, investors should always be alert to the potential, particularly after our experience just a few years ago. Markets can misprice risk, as investors in subprime mortgages discovered in 2008. The value of oil, gas and coal companies depend in part on their reserves. What then of scenarios where reserves can never be dug up and burned? Over the next decade date determined climate policies will likely converge on rules that leave a large portions of carbon in the ground. Analysis by The Non-profit Carbon Tracker along with the Grantham Research Institute on Climate Change at the London School of Economics finds that if global temperatures are not to rise by more than 2°C, the most that climate scientists deem prudent only ~t 1,000 gigatons of CO2 (GTCO2) can be released between now and 2050. The is the world’s so-called “carbon budget”. Most of the reserves are owned by governments or state energy firms; they could be left in the ground by public-policy choice (i.e. if governments take the 2°C target seriously). But the reserves of listed oil companies are different. These are assets developed using money raised from investors who expect a return. Proven reserves of listed firms contain 762GTCO2—most of what can prudently be burned before 2050. Listed potential reserves have 1,541GTCO2 embedded in them. So companies and governments already have far more oil, gas and coal than they need (again, assuming temperatures are not to rise by more than 2°C). Logically, the response to this would be for governments to leave their reserves untouched and for companies to run theirs slowly down, returning more of what they earn to shareholders. Neither of these things is happening. State-owned companies are taking an increasing share of total energy output. And in 2012 the 200 largest listed oil, gas and coal companies spent five times as much—$674 billion—on developing new reserves as they did returning money to shareholders ($126 billion). ExxonMobil alone plans to spend $37 billion a year on exploration in each of the next three years. Notably the firm is setting an internal price on carbon, much higher than than many other targets Presumably this effort is a hedge against policy actions which it opposes by and large. Planning to extract more carbon fuel reserves at first cut seems illogical in the context of unburnable carbon. Perhaps companies are betting that government climate policies will fail. In this case they can burn all their reserves, including new ones, after all. Our best science tells that this his implies global temperatures soaring past the 2°C mark, if not restrained by technological advances, such as carbon capture and storage, or geo-engineering. And indeed in the current policy landscape make such bets seem rational. On April 16th the European Parliament voted against attempts to shore up Europe’s emissions trading system against collapse. The system is the EU’s flagship environmental policy and the world’s largest carbon market. This suggests the EY has lost their will to endure short-term pain for long-term environmental gain. Nor is this the only such sign. Several cash-strapped EU countries are cutting subsidies for renewable energy. And governments around the world have failed to make progress towards a new global climate-change treaty. So on the other hand, betting against tough climate policies seems almost prudent. But that is not what companies say they are doing. All the big energy firms claim to be green. They say they use high implicit carbon prices to guide investment decisions. Nearly all claim to support climate policies. None predicts their failure. Yet markets clearly are mispricing risk by valuing companies as if all their reserves will be burned. Investors treat reserves as an indicator of future revenues. They therefore require companies to replace reserves depleted by production, even though this runs foul of emission-reduction policies. Fossil-fuel firms live and die by a measure called the reserve replacement ratio, which must remain above 100%. Companies see their shares marked down if the ratio falls, even when they pull the plug on dodgy, expensive projects. This happened to Shell, for example, when it suspended drilling in the Arctic in February. And many energy industry analysts and actors have watched rapid draw down of valuations in US coal producers. Are Carbon Bubble Concerns are Overstated? Fossil fuel companies are among the largest companies in the world, but their total market capitalization is small relative to the total stock market. Even if they were wiped out completely, the world economy would shrug its shoulders and move on. We have witnessed rapid falls in the stock market value of fossil fuel companies – of all companies as the oil price fell, or of particular companies as disaster struck – and we know from those episodes that the economic impact is limited. Quantification of climate risk within carbon-heavy assets derives in main part from the widely cited 2°C threshold for irreversible damage from climate change, and its resulting “carbon budget” as determined by the International Energy Agency. It indicates that at least two-thirds of fossil fuel reserves will not be monetized if we are to stay below 2° of warming. Serious consequences for investors in oil, gas and coal would necessarily ensue. The draft technical report, Summary for Policy Makers, provides more detail on this. It further assesses a probability of 1% or less that the climate sensitivity could be less than 1°C. That shouldn’t be surprising, since temperatures have already apparently risen by 0.8°C above pre-industrial levels. Not all carbon-intensive assets are created equal. The vulnerability of an investment in fossil fuel reserves or hardware to competition from renewable energy and decarbonization does not just depend on the carbon intensity of the fuel type — its emissions per equivalent barrel or BTU — but also on its functions and unique attributes. Coal for example is rapidly loosing ground for a host of reasons in China and the US. New EPA regulations makeit much harder to build new coal-fired power plants in the US. And fundamental, structural challenges facing coal. ADD CHINA SMOG PICTURE HERE. Power generation now accounts for 93% of US coal consumption, as non-power commercial and industrial demand has declined. This leaves coal producers increasingly reliant on a utility market that has many other (and cleaner) options for generating electricity. That’s particularly true as the production of natural gas, with lower lifecycle greenhouse gas emissions per Megawatt-hour of generation, ramps up, both domestically and globally. The takeaway: coal accounts for about half of the global fossil fuel reserves that Mr. Gore and others presume to be caught up in an asset bubble. At 29% of global fossil fuel reserves, adjusted for energy content, oil still has no full-scale, mass-market alternative in its primary market of transportation energy. Electric vehicles offer more oil-substitution potential in the long run, though they are growing from an even smaller base than wind and solar energy. Their growth will also impose new burdens on the power grid and expand the challenge of displacing the highest-emitting electricity generation with low-carbon sources. Meanwhile, natural gas, at 20% of global fossil fuel reserves, offers the largest-scale substitute for either coal or oil. In any case, it has the lowest priority for substitution by renewables on an emissions basis, and so should be least susceptible to a notional carbon bubble. The most important factors in the valuation of any company engaged in discovering and producing hydrocarbons: discounted cash flow (DCF) and production decline rates most oil and gas companies valuations derive from risked DCF models where near-term production and profits count much more than distant ones. So compounded decline curves typical of many large hydrocarbon projects mean that the first 3-5 years of a project account for more than half its undiscounted cash flows. Hence they will be highly sensitive to long-term uncertainties in aggregate. Industry professionals tell us that this is even truer of shale gas and tight oil production, which yield faster returns and decline more rapidly. Based on estimates of our own and those of others, the risk of a 10% or greater drop in global demand for oil or gas in the 2030s would not really impact on their price targets for companies, if balance sheet concerns are the only factor once considers. Yet those that ignore sentiment and animal spirits do so at their peril. The instantiation of a carbon bubble in fossil fuel assets will ultimately depend on investor ignorance and bias against climate-response risks, presumably because companies haven’t quantified those risks for them. To the extent the latter condition is true, it represents an opportunity for companies seeking to capitalize on the boom in sustainable investing. At stake is the integrity of a market that affects the daily valuations of private and public money alike, from the $261 billion Sacramento-based California Public Employees’ Retirement System to the $237 billion Scottish Widows Investment Partnership in Edinburgh, from the $4.1 trillion BlackRock Inc. (BLK) in Manhattan, the world’s largest asset manager, to the $1.2 trillion Tokyo-based Government Pension Investment Fund, the biggest pension. “This is a market that is far more amenable to collusive practices than it is to competitive practices,” said Andre Spicer, a professor at the Cass Business School in London, who is researching the behavior of traders. The news about manmade climate change gets more dire every day. So in conclusion, as much as possible sustainable investors need to track their carbon exposure, consider shadow banking, policy driven mandates on institutional investors, and contingencies that not all market participants have the ability to see the same information at the same time. Such lack of access to actionable data on carbon fuel price movement will create noise in market signals. Fiducaries and investors need to ensure they are properly diversified in not completely decarbonized in the event of rapid movement to equilibrium, that is the bursting of a bubble. In 2013 three companies become the first corporate Green bond issuers, Bank of America Merrill Lynch and Swedish property Group Vasakronan. All found solid demand and raised a combined total equivalent to around $2.6 billion. Market issuance in November increased the market size by 50%. Issuers and investors not traditionally interested in Green offerings are entering the marketplace thereby driving up demand. Proceeds from the bonds are used for projects aimed at curbing greenhouse gas emissions or adapting to a warmer climate, to sustainable agriculture in China. The Climate-related bond market stands at $346 billion vs, the ~$2.3 trillion in investment grade bond issuance in the first 3 quarters of 2013.
expectations that more will follow. Even with all the above taken into consideration, these instruments only form a fraction of the multi-trillion dollar global bond market. Yet the entrance of issuers from the private sector marks an important expansion beyond the limited domain of development banks. Interest among new buyers, corporate bond investors and others an inflection tipping point. While still a a still-niche sector, pricing has revealed consistent demand and enthusiasm for ethical investing which means essential benchmarks of liquidity are forming for the nascent market. Critics have held that the number of governments cutting their subsidies for renewable energy projects would curtail high demand for Green bonds. Evidently, even as subsidies wane, companies still want to use debt to finance their projects and accurate market assessments by issuers has delivered attractive pricing for many investors. As markets put more money behind Green bonds, Fund Balance sees a breakthrough for sustainable fixed income instruments that qualify as Socially Responsible Investing, or SRI, including but not limited to Green bonds. In short, ethical investment in the fixed income domain is becoming ever more mainstream. As a result of the success of these issues, serious interest is being expressed from potential new corporate issuers in sectors such as utilities, telecoms and real estate indicating a breakout from SRI themed investors. For example, 60 percent of an issue the French firm EDF issue was taken up by SRI investors, some, such as Jupiter Fund Management, which invested for the first time in a Green bond as part of EDF’s issue, were not concerned about the label attached to it. Societe Generale reports that investor demand has risen over the last 18 months and been growing since the first corporate SRI bond was successfully launched last October by Air Liquide. In conclusion, the main theme in sustainable fixed income is that management teams in a diversity of arenas increasingly place sustainability high on their priorities for long-term planning. We recommend same in their planning as they look to the second half of the 2010’s. Physicist Jesse Henshaw observes its “not what you know but what your world is learning”. In the paper System Energy Assessment (SEA), Defining a Standard Measure of EROI for Energy Businesses as Whole Systems, co-authored with Carey King, and Jay Zarnikau, findings are presented that indicate a ” ~500% error in carbon and energy impact measures form not accounting for businesses working as whole working systems”. The world’s carbon budget is almost certainly far tighter than international policymakers acknowledge and financial planners envision. And with this in mind well functioning, publicly supported carbon markets, cap and trade mechanisms, and carbon tax regimens are of tremendous importance in addressing the challenges of climate change. But behavioral changes and entire redefintions of economic growth and prosperity need be the objective for policy-making praxis and econometric fixities. Exxon posts its assumption on its website. Company spokesman Alan Jeffers said the company is also operating under the assumption that the price will increase to $80 a ton by 2040. Meanwhile, two firms that we follow at Fund Balance, Hess (HES) and Statoil (STO), are leading the industry in their commitments to sustainability and carbon mitigation under the OGSS’s Global Reporting Initiative can be found here and here. Their reports can be seen here and here. At Fund Balance, while we strive to help partners decarbonize portfolios we also work to identify carbon firms addressing the challenges in bringing about determined yet appropriately measured transitions to a low carbon energy future. Solar electricity hitting grid parity with coal. Advancing renewable energy from ocean waves and harnessing ocean waves to produce fresh water. Ultra-thin solar cells from the likes Alta Devices, a Silicon Valley solar manufacturer that are break ing efficiency records. Cutting electricity bills with direct current power. Innovative financing bringing clean energy to more people. In DC, the first ever property-assessed clean energy (PACE) project allows investments in efficiency and renewables to be repaid through a special tax levied on the property, which lowers the risk for owners. Crowdfunding for clean energy projects made major strides bringing decentralized renewable energy to more people — particularly the world’s poor — and Solar Mosaic is pioneering crowdfunding to pool community investments in solar in the United States. And Washington, DC voted to bring in virtual net metering, which allows people to buy a portion of a larger solar or wind project, and then have their portion of the electricity sold or credited back to the grid on their behalf, reducing the bill. More can be found on these developments here in a post from Think Progress. ONE hears little talk of a potential carbon bubble in financial media and the role of policymakers in its potential formation. Yet, a broad array of business and economic institutions along with professional investors such as Tom Steyer maintain carbon-free portfolios in response to negative long-term trends for carbon-derived asset values. Asset bubbles typically refer to cases where a group of widely held assets are overvalued as evidenced by appreciation rates and valuation ratios far above their historic on trend averages. This overvaluation then implies sudden, acute drops in value for both the holder of the assets. This effects the broader market as a function of the assets default presence in keystone funds and indices that must reflect markets in composite. Yet, definitions of asset bubbles exist primarily in the vernacular. Many scholars and technicians argue that buubles can only be recognized post ante. Setting this debate aside, potential equity and real estate asset bubbles discussions appear frequently in the media while the possibility of a carbon bubble is largely ignored. Why? Of these three possible bubbles, which of them present the graver threat to shared prosperity? As we see above fuel consumption is flat in the US and growing in the BRICs. Given that China and India in particular are investing heavily in renewables, how likely are their rates of consumption to accelerate? Looking out, prospects for revenue growth curves for Big Oil flatten at best due to higher projected carbon prices. A carbon bubble and its twin risk vector climate change represent serious long term risk to a great many more citizens and their wealth, well being, and security than putative stimulus from Quantitative Easing (QE) and any attendant bubbles. So, what to make of the talk of equity asset bubbles? Currently, ~20% of US citizens own ~80% of the stock market and wages over the last 20 years have been flat to declining. This coupled with the decreasing share of productivity to 90 percent plus of US workers beg the question: for whom are potential asset bubbles so dangerous? Certainly many households are dependent on their comparatively minimal stakes in equity markets. For example, billionaires can buy low and sell when bubbles burst, but those living off dividends and capital gains to pay for food, medicine, and shelter cannot. Further, income inequality, long-term under- and unemployment mean fewer and fewer labor force participants accumulate enough monthly income to set aside sufficient savings through asset market participation. The great complexity and increasing lack of transparency as typified by LIBOR and ISDAfix insider trading shuts out the majority of non-professional investors and even many smaller scale professional ones. The ranks of Wal Mart associates and pizza-deliverers swells. Consequently, large swaths of laborers lack both the information and capital to gain access to the phenomenal growth and opportunities afforded to the shrinking few within the hedge fund and luxury class. Moreover, when QE ends this will signal uptrending inflation which in turn will mean rising demand, congruent with stronger earnings and prospects for large components of blue-chip indices. And, even if over-bought, new iwill arise in a sell off, long term positions won’t need to change all that much. After all, as superstar investor Henry Kravis points out consumer spending is 70% of the US economy which is the world’s largest. So very plausible demand-side scenarios exist whereby QE does not usher in a long-term bear market. Are Major US Real Estate Markets Becoming Overvalued? Housing Affordability Index. Source National Association of Realtors. Looking at real estate, some see a bubble inflating among certain major urban markets. In aggregate though the real estate market has mostly trended sideways. Existing home sales are still below 2007 levels as are new home starts. More people are renting. So while property owners can command handsome rent appreciation the market for new homes is flat on a broad basis, so concerns of pockets of bubbles in real estate are basically marginalia. One of the benefit of the Dot Com bubble was quite literally its network effect: the US economy developed its internet infrastructure which subsequently laid the foundation for Google, Facebook, Twitter along with an entire generation’s worth of capital formation for savers and investors. Its legacies include cloud computing, social media, big data, etc. And, even amid the irrational exuberance driven carnage of the Dot Con Bubble burst much essential research and development was performed weeding out many shibbolleths and flawed business models. Housing prices have only now returned to historical levels. Click to Enlarge. Are all bubbles are alike? Probably not. Lastly, what were reality-based economists calling for to bring us out of the Lesser Depression: fiscal stimulus aimed at upgrading US infrastructure into an era of greater efficiency via renewable energy and less pollution, a pernicious form of inefficiency. Regulatory capture allows for its cost to be shifted onto the public accounts and thus obscured accounting of publicly trade firms. For evidence of the inefficiencies wrought by pollution, just look at firms leaving China due to rampant pollution or at the points shaved off its GDP by endemic air and water pollution. On the positive side, China’s future generations will reap benefits from its investments in the clean and renewable energy now. The US needs to focus on those benefits for its future generations by borrowing cheaply while there is still time to build infrastructure and cultivate a new breed of social institutions. These steps will lead to a healthier and more prosperous future than cuts to food programs for those living in poverty now. Comparison of the GDP deflator (unused for policy indication by the Fed as it contains grain and oil prices, which fluctuate a lot, making it an unstable, unreliable measure of underlying inflation) vs. the consumption deflator -excluding food and energy. Click to enlarge. the past seven years or so–not to 58.5%. And we would have expected the collapse of people’s retirement savings either in housing or in stocks in 2008 to have led many Americans to postpone retirement. Given the collapse in the value of retirement savings and their impact on desired retirements, I see a healthy American economy today as one that would still have the same adult employment-to-population ratio of 63% as the economy of the mid-2000s. From that perspective, we are not halfway back to health. We had a gap of 4.5% points between actual employment and full employment at the end of 2009. We have a gap of 4.5% points between actual employment and full employment today. We are flatlining. It is true that in late 2009 there were still real and rational fears that things might become worse very quickly, and that that possibility is no longer on the menu. But in my view our “recovery” has taken the form not of things getting better but of having successfully guarded against the possibility that things would get even worse. And that is a very feeble recovery indeed. AT the close of 2012, some analysts saw the mix of retrenchment of regulatory programs in the EU and lack of a co-ordinated clean energy strategy in the US combined with China’s burgeoning carbon footprint as a gun to the head of Environmental, Social, Governance (ESG) and related (CSR, SRI) investment theses. Many saw it more as a water pistol. We were in the latter group. In general and in context, Fund Balance sustainable investing advisory continued its strong market out-performance for 2013. While the Equilibrer broader mid to large cap market portfolio has essentially tracked the S&P’s ~22.4% YTD and 5.4% Q3 performance for 2013, the LED specific Leading The LED ETF/portfolio outperformed its peers as has the Here Comes The Sun solar based ETF/portfolio with returns of 43.3% and 267.3% for Q3 2013 respectively. Important global and international developments merit brief discussion with three general developments of note. Firstly, China is still enigmatic in terms of its role in the sustainability story. It has both helped drive price points down for solar power so as to allow for competitiveness all the while ramping up its coal consumption and continuing to generate headlines reporting local ecological collapses: entire cities shut down by pollution; whole stretches of rivers toxified beyond life-support thresholds and entire aquifers rendered unfit for human consumption. Hence rapid scale back of its coal consumption becomes even more critical as the World Health Organization announced its findings of definitive links between air pollution and cancer. Secondly, United States based endeavors, particularly those based in our Western states, continue to surprise on the upside, whether via advances in solar storage, LED innovation, or other clean economy initiatives enacted by California, whose economic mass and dynamism compels neighbors and salesman to bring clean economy wares to its market. Thirdly, even as the US has surpassed Russia as the world’s largest exporter of refined petroleum product thanks to shale gas and even as fracked natural gas diminishes coal based power generation, the reality of negative implications of a carbon bubble for traditional hydrocarbon marketers continue to sink into the thinking of the populace and fund managers alike. The IPCC in its 5th Assessment of Climate Change avers of the necessity of leaving 2/3 of known carbon reserves in the ground to secure our future. The Fund Balance view is that the risk of carbon dioxide driven climate change portends of a sub-prime like collapse of carbon-based asset values and such represents a significantly graver threat to intergenerational prosperity moving forward than US public debt and deficit spending. After severe buffeting by regulatory retrenchment and policymaker recalcitrance in 2012, our solar plays as well as those of our peers significantly outperformed the S&P 500 and the small cap weighted Russell 2000 (10.21% return for Q3) both on YTD and Q3 bases. Solar power usage continues to expand its role in mainstream residential markets as well as commercial ones. Wal Mart for example now has almost twice as much capacity as second-place Costco. Wal-Mart is converting more sun into power than 38 U.S. states. For market participants that took positions at the beginning of 2012, the question now is: to take profits or not? We recommend those interested in playing the psychology and cycles of the market take a hard look at realizing some gains by selling with an eye to build reserves for coming troughs. Those with long views should still consider some intra- and inter- asset class reallocations, by building positions in sub-sectors like solar storage, maintenance, and microgrid in combination with more early stage private ventures with an eye towards gaining exposure to high risk/reward stewardship. Volatility will continue to feature prominently in the solar equity market as solar power generation increasingly closes on parity with conventional generation on a $/megawatt basis. In sum, we have no doubts on the long view, robust growth story for the solar sector and consider decisions about exposure a question of one’s investment time frame and goals. But now would be a good time to take some profits if so inclined. LEDs are lighting the way in Buenos Aires to Dubai to the shelves of Home Depot. Research from economists at Yale show that civilization and prosperity correlate with the amount of artificial light output. Indeed light rendered a 20th century of progress. The clean economics of LEDs portend well for a 21st century of sustainable, equitable, smart growth driven prosperity. Philips soaring third-quarter earnings show its continuing leadership in the world’s LED market. It reported its Q3 sales revealing LED sales growth of 33% from a year ago and now representing 30% of Philips’ total US$2.85 billion lighting sales. The company now offers US consumers LEDs for US$5 at the Home Depot, as well as in partnerships with large utilities companies. Further, while all Philips’ divisions reported greater operating profits, the lighting unit saw the biggest improvement, which it’s management crediting strong LED sales and lower restructuring charges. Philips is the exclusive supplier to the Dubai Municipality’s buildings with its intelligent LED solutions. They claim their lighting solutions are saving 50% in electricity usage. Dubai for its part states that its mission is to become the most sustainable city in the world. Thousands of municipalities have adopted LED streetlighting and millions of households have switched on LED systems and fixtures. LED generated luminance is not only brighter and more efficient but saves citizens money in the long-term making LEDs are a common-sense purchase in economically challenging time. On a 5 pt scale for valuation: 5 => historically high valuation relative to other sectors. Note: Reversion to mean historic broader market valuation levels of 3 coupled with price decreases, if only for a few quarters, should not be unexpected. Q4 2013 will require preparation for a measured rebalancing from broad, mid- and large-cap concerns towards a focused, sub-sector driven approach with a long view, looking at funds and early stage ventures with acceptably low levels of technology risk. Further, heightened attention will be paid to the private equity asset class as we see it poised to outperform over the next 5 years. Investments in energy efficiency alone can create 1.5 million jobs in America by 2030 — so at Fund Balance we see participating in building the clean economy as an important part of good corporate citizenship as well. We will seek out for opportunities in subsectors in the solar market in terms of storage such as Solana and automated systems for cleaning solar panels like Serbot and QBotix, both of which are not publically traded. Leaders of 70 the largest pension funds in the U.S. are calling on fossil fuel companies to detail their management plans the switch to cleaner energy. These concern is that their portfolio companies’ profitability in the future will slow and disappear as the world shifts away from oil and coal and towards clean energy. These 70 funds are asking 45 of the world’s largest oil, gas, coal and electric companies to conduct detailed studies of how policies to curb climate change will impact the fossil fuel business. The above is but one reason why the Fund Balance outlook for Outlook for Q4 2013 and into 2014 is that clean energy is will one of the main high return sectors for the coming decade. With this is mind we will continue to bring private equity further to the fore in pursuit of our mission to build wealth by investing and contributing to sustainable economics and culture. Continue to work with solar industry leaders at the individual level such as Jigar Shah and at the institutional level such as The Credit Suisse Impact Investment Group amongst others, to identify opportunities in the private equity asset class. In the public equity markets plan to undertake coverage of a wider and deeper range to sustainability leaders with a such as Philips, which we have added to Equilibrer. So the future is uncertain, a reality acknowledged in the title of Nordhaus’s new book, The Climate Casino: Risk, Uncertainty, and Economics for a Warming World. Yet decisions must be made taking the future—and sometimes the very long-term future—into account. This is true when it comes to exhaustible resources, where every barrel of oil we burn today is a barrel that won’t be available for future generations. It is all the more true for global warming, where every ton of carbon dioxide we emit today will remain in the atmosphere, changing the world’s climate, for generations to come. And as Nordhaus emphasizes, although perhaps not as strongly as some would like, when it comes to climate change uncertainty strengthens, not weakens, the case for action now. ON the way to closing out 2013, renewable energy sectors quietly outperform the broader market. Notably, solar power and LED systems have entered prime-time in a big way. Wal Mart has deployed, and is profiting on, the largest portfolio of solar panels of any retailer in the nation, just ahead of Apple. Costco runs 2nd in the retail sector. Wal Mart’s implementation alone exceeds that of 38 US States combined. Meanwhile Dutch conglomerate Philips reports 33% profitability growth in its LED sales along with a presence in Home Depot stores. And residential solar has gone mainstream while distributed generation projects continue to increase exponentially, even as regulatory support scales down. Another intriguing development is Sunpower’s un-subsidized 70 MW plant in Chile that will sell solar directly on the spot market. This may well be the model of the future. GTM Research and SEIA report solar system costs decreases of 40% since the start of 2011 and 50% from 2010. Commercial installation costs dropped 14.7% to $3.71 per watt for 2013. Assuming a 10% return on investment and a 20% capacity factor, projected cost of this electricity are 8.5 cents per kW-hr, below grid prices ex-ante tax benefits. The outlook grows ever brighter when one factors in twinned developments in microgrid and microfinance. In the case of microgrids, or distributed generation, both Connecticut and New York are deploying microgrids in the aftermath of Hurricane Sandy. New firms like Mosaic lead the way with cash flow generation for retail investors via interest rate income from solar projects over its crowdsourcing platform. For Dutch Design week 2013 Lucid created a base frame where visitors can add to, and manipulate, light formations. So what is the signal here? Basically, its that in the US, clean and sustainable economic advancement presents with wide variability around the state by state valence, with the balance now tipping to uptake in a majority of US States. Some of the sunniest states are in the late adopter category, there is still a large pool of untapped markets. While plenty of noise was generated around the predictable yet minor growing pains in US green energy public programs, these programs has spurned free market opportunities for sustainable value creation — even as subsidies are scaled back far more sharply than they were for other sectors like fossil fuel extraction and industrial agriculture. Investors then, should look past efforts to define complex problems from a single datapoint (Solyndra perhaps is the best known and most overstated example). Given these developments, which are strongly indicative of an upward sloping trend line, we think investors are well advised to focus on mid and long term possibilities. Additionally, investors would be wise to monitor the growing concern of asset managers about overvaluation in petroleum assets: 70 of the largest pension funds are already inquiring as to risk exposure to a Carbon-based Asset Bubble to the petro-product majors. One thing is certain, extemporizing around the economic inefficiencies of pollution on the part of petroleum producers has long since outlived its persuasiveness for many institutional and individual market participants. More analysis on this is in the works at Fund Balance. Does it make sense to tell someone that doesn’t have health insurance to go to the doctor? Does it make sense to expect jobless and underemployed citizens to save more? Many of the most profitable corporations across the US perennially underfund their pensions while simultaneously funding campaigns for privatization of social security paired with cuts to the program. Pension shortfalls. Click to enlarge. Yet, these same corporations oppose raising the cap on payroll taxes or asking Wall Street financiers to sacrifice via minimal financial transaction taxes common in the US during many a bull market and still common in the EU and Asia. All of this set against a backdrop of historically high corporate profits, S&P record highs, and stratospheric ratios of CEO pay to that of middle management and wage earners. The term generational theft is popular argot for corporate bureaucrats and their funding recipients in Washington, DC. Many of the CEO’s and hedge fund managers recommend pain of the majority and none for themselves. Yet, US taxpayers currently fund corporations at an historical scale via low interest rate loans and subsidies. This is the real generational theft: draining the the US middle class so financial speculators can ship away jobs, keep cash in tax havens, and speculate on Asian markets. We see a pronounced difference between how people are shopping today and before the recession,” the executive explained. “Consumers are living pay cheque by pay cheque, and they tend to spend accordingly. Then you have 50 million people on food stamps and that has cycles too. So for our business it has become critical to understand the cycle –when pay [and benefit] cheques are arriving. Hence, the mostly austerity driven so-called recovery further reveals another deteriorating economic indicator for the middle class. Compare and contrast this with austerity champion the Walton Family and its Walmart. Without accounting for its massive local and federal tax breaks and subsidies, Walmart receives even more welfare from US taxpayers by paying its workers so little that they cannot afford healthcare and so must utilize social programs funded by their neighbors and fellow Walmart customers. In short, the world’s largest employer, after the US Department of Defense and the Chinese Military, relies on taxpayers rather than participation in the general welfare of the communities in which it operates and generates huge profits for its small group of majority shareholders (5% of of its owners possess 50% of its shares). Is this an example of good corporate citizenship? US Profits and Investment 1929 — 2012. Click to Enlarge. Nevertheless, the most economically secure in our society mostly talk of deficits and are enabled by our nation’s highly consolidated media to dominate the public debate thereby granting them disproportionate exposure. Yet, their arguments that austerity and fiscal contraction will resolve the unemployment crisis fail logical and evidentiary tests time and again. Sequestration is projected to shave a point off GDP this year. As GDP shrinks consumers have less money to spend and consequently labor demands falls. Further, low-paying and low-to-no benefit jobs, which are the bulk of jobs now being created in the US, threaten a generation’s retirement security and access healthcare (health services as opposed to health insurance need disintermediation). Furthermore, corporations and the super affluent pay lower taxes than ever. Supporters for this program argue that it frees up capital to be reinvested in the economy. But, this not the pattern of the past 30 years. In the last decade the pace of reinvesting these perquisites into the economy or funding pensions has all but completely lapsed. Rather, these windfalls are shipped to hedge funds and tax havens. Additional study finds deeper problems. That was my goal in my first law review article, “Improving Retirement Options for Employees”, which recently came out in the University of Pennsylvania Journal of Business Law. The general problem is one I’ve touched on several times: many Americans are woefully underprepared for retirement, in part because of a deeply flawed “system” of employment-based retirement plans that shifts risk onto individuals and brings out the worse of everyone’s behavioral irrationalities. The specific problem I address in the article is the fact that most defined-contribution retirement plans (of which the 401(k) is the most prominent example) are stocked with expensive, actively managed mutual funds that, depending on your viewpoint, either (a) logically cannot beat the market on an expected, risk-adjusted basis or (b) overwhelmingly fail to beat the market on a risk-adjusted basis. Could this meltdown have been avoided? Should rating agencies have spotted it? Well, this is how it would work with the rating agencies when we were building a new CDO. They would tell us their parameters and criteria; if you meet this requirement, you get that rating and so on. And they gave out a free model so we could test our product and tweak our portfolio for the CDO until it fit, I mean get the rating that we wanted. We would do a lot of stress-testing ourselves too, of course we would. We’d pretend the market changed and run the models to see how our products would hold. But what happened during the financial crisis was like a perfect storm. In our tests we would assume the market moved, say, 10% – while in reality it rarely moved more than 1%. Now the crisis happens and suddenly the market moves 30%. Our models were based on what we saw as normal. Now we saw numbers behave in ways barely conceived possible. Nanex ~ Order Routing Animation ~ 02-May-2013 ~ JNJ .Click to Enlarge. Why are record profits and CEO pay more and more divergent from the economic well being of the society’s whose labor and resources they use? Have low interest rates formed an economic bubble? They are significantly lower than their 10 year average measured against similar conditions. Stephen Schwarzman of the Blackstone Group thinks so. He and others predict the next great fortunes will arise from precise timing of its bursting. Yet, fortunes and reputations have diminished over the past four years or so as a consequence of betting on its collapse ex ante. The markets continue to signal low, unchanging default risk for U.S. debt in both Credit Default Spreads (CDS) and the Exchange Traded Funds (ETFs) which short US debt. Economist and housing market expert Robert Schiller sees a cloudy outlook for mortgage rate increases. Paul Krugman, who correctly called the housing bubble in 2005, doesn’t see any evidence for a rate rise in the short and mid-runs. CDS Spreads US, Brazil, Russia, China, Source: Deutsche Bank Feb. 2013. Click to Enlarge. Keynes famously said that in the long run we’re all dead. And, this is not only an Apres Moi, la Deluge argument. Time scales for ending our employment crisis matter to our children and grandchildren as well. History shows that economic policy and social policy timescales are often not commensurate. In policy circles and television talking head broadcasts, conventional wisdom categorically assumes sans empirics, interest rate trajectories with a strong upward bias. Yet, this bias distracts us from the real problem: the national U.S. employment problem and the long term damage of which seriously threatens our economy, our infrastructure, and our children’s future. How to bend this curve downward? Further, ample evidence shows that debt stabilization comes more surely from economic growth at ~4%. Unemployment will definitely come down, as will the federal debt, if we grow the economy by this 4% benchmark just as we did in the last four years of the Clinton Administration. For example, in 2000 the unemployment rate averaged 4% per month and the U.S. had a budget surplus. Extension of existing price setting mechanisms to Medicare could save tens of billions of dollars if prices similar to those already achieved by other federal programs could be reached. Whether or not this is a political or economic possibility, the magnitude of these savings cannot be ignored. Low unemployment and reasonable wage growth will signal the time for focusing on national debt. Logic dictates that simply because two things can happen, their probabilities aren’t equal. And, key economic and social indicators signal little inflation and interest pressure on the horizon, even if low rates can lead to bubbles. So the government can borrow now at historically low interest rates and invest the money in an infrastructure for a clean economy with a low probability of inflating a bubble in the short to mid runs. This in one of the ways a government that controls the world’s reserve currency is significantly unlike a household budget. Prediction markets probability of US Recession in 2013. Source: PredictWise. Click To Enlarge. Many observers point to how Federal Reserve policies have kept interest rates low since 2008. However, the Federal Reserve announced during their December meeting that it will begin reversing its easing policies when the job market improves substantially, when the unemployment rate falls to 6.5%, or when inflation exceeds 2.5% per year. Current forecasts call for ~2% growth in the US in 2013 and ~15% chance of a recession — admittedly not an immaterial probability. So here again, 2013 likely will not vindicate interest rate speculators and bond short sellers. In 1946 the debt was 120% of the GDP. It went straight down to about 32% in 1973. We had increased spending and deficits almost every year. The debt in dollars almost doubled. Real median household income surged 74% while CEO’s earned 50 times what their workers earned; it is 500 times today. The GDP averaged 3.8% growth. The U.S. resolved a debt crisis with more debt. Interest rates will rise eventually. That is not all bad. This would likely mean the unleashing of pent-up demand. And, the resultant weak dollar would boost exports of solar panels and the produce of sustainable agriculture for which there is strong demand in Europe and Japan. So, household books balance and run surpluses while the government takes on debt as the lender, consumer, and with QE, even borrower, of last resort. Federal Minimum Wage. Source New York Times. Click To Enlarge. Roughly 30% of the US population will be over the age of 65. According to MSN Money, about a third of those who are 10 years away from their planned retirement age have saved less than $25,000 which is $875,000 short of the Employee Benefit Research Institute suggested $900,000 that a typical person would need to live out his or her retirement years. Currently about 10% of seniors live in poverty; this number is bound to increase as more people who have inadequate savings reach retirement age, and Social Security fails to keep up with inflation. Taking these numbers into consideration with the fact the consistent austerian policies very likely mean the U.S. faces a multi-decadal drop in aggregate demand — the main driver of growth which is in turn the most tried and true process for debt reduction — serious policy challenges face the US. This underscores the need to create jobs first and build a strong revenue base around a clean economy so that pollution does not eat away the gains via increased healthcare costs and decreased land values. Austerity mostly leads to more lay-offs, comparatively weak job creation (with low wages and benefit packages requiring taxpayers to pick up the costs, and a environment where wages stagnate or fall. Stunted wage growth may bode in the short run for the Oligarchy, but not the well being of the the majority of U.S. citizens whose labor and tax-dollars are used to finance its mighty military and Too-Big To-Fail-or-Jail banks. To address the long term unemployment crisis in 2013, the U.S. must increase investment in its clean economy and infrastructure. U.S. citizens own the world’s most robust non-profit, namely the United States Government. The U.S. can act now for a reason that trumps profit: the General Welfare. Renewable energy, infrastructure, and pollution remediation increase labor demand and thus, long term, sustainable employment. By contrast, the dirty energy sector primarily provides temporary and short term jobs. Fossil fuels, automation, and de-unionization have converged to aggressively drive down the middle class share of profits generated by our national economy. The outlook for labor is further complicated by rapid uptake of capital-biased technology: machine intelligence that further shifts profit away from labor by replacing its participation in the economy with robots. Dirty energy outputs unsustainable amounts of seemingly cheap energy and goods. Coal extractionists value coal at low domestic prices to skip large royalty payouts when mining federal land all the while fetching much higher prices on international markets. The inevitable societal costs of damaged environments and cleaning up pollution reveals this bargain to be Faustian and, as such, provides a diminishing benefit. Further, environmental protections and clean energy factor into job growth with wages and salaries that accrue to the economy as opposed to rentier payments that primarily fill Swiss bank accounts. Restraining dirty energy shifts capital to labor thereby counterbalancing the decadal trend of asymmetric capital accumulation to a shrinking few. Corporate profits continue to surge to multi-year record highs. Yet, as a share of GDP, wages have declined over the past thirty years. This has become in its own way a kind of hidden inflation. Clean energy policies address this imbalance with greater quantities of quality jobs. Currently in the U.S., our most pressing problem is one of high, long term unemployment. Deficit and debt to GDP ratios matter; yet, the primary driver of deficits is a lack of employment growth. History and empirical evidence show how these ratios, as well incomes inequalities, quickly come down as revenues grow due to greater employment at living wages. Further, industry sits on record hoards of capital, yet chooses not to invest. Now is the time to increase public sector spending to create low impact demand. Clean energy is an optimal starting point for increasing demand per capita in sectors that are sustainable and regenerative. Alleviating contemporary unemployment and ensuring that its does not become a long term crisis requires rejection of classical economic conventions, namely, that labor is only a cost to be mercilessly driven down and that search frictions are a hard, growing reality: i.e. in the real world, it’s expensive to relocate and retrain. For the long term unemployed, it is next to impossible.Yet, social innovation and impact investing policies can restore balance. Some argue that the subsidies required to launch a green economy are too steep. But, that assertion has little evidentiary support and fails a common sense test as well. In reality, clean energy drives labor demand via its need for large, scaled up amounts of infrastructure, operation, remediation and, of course, R&D. Reduced labor costs are not resulting in shared prosperity. Does the private sector truly want a continued collapse of labor prices in the U.S.? Labor is a cost in classical economic thinking. Lower costs mean cheaper goods and services; a greater general welfare in principal – as long as producers do not loose their incentive to pass on cost efficiencies to consumers. Yet, in an era of record corporate profits, employment growth has steeply decelerated. Core CPI has been low, but when stagnant wages are considered along with higher education and healthcare costs, the benefits of lower CPI seem rather ephemeral. Here again, a green economy points a way forward. A recent MIT carbon tax study lays out scenarios where a carbon tax could either be revenue neutral or partially so when the excess revenue is used to reduce debt or build infrastructure. In addition to raising revenue, it would reduce pollution by incentivizing the transportation industry to generate more efficient products. This is an instance where the tax code can help create more progressive outcomes, and in this era of ever rising inequality, which recent data suggests is increasingly decoupled from recoveries, can address that inequality. Restructuring the code needs to be a major, bipartisan goal. Annie Lennox to Narrate Documentary centered around Haitian Artist Frankétienne, 2009 Nobel Prize candidate. Haitian Artist Frankétienne, 2009 Nobel Prize candidate. NEW YORK, N.Y. The New York based Haitian Cultural Foundation is proud to announce that internationally celebrated recording artist and activist ANNIE LENNOX will serve as principal narrator for the powerful, moving, and inspiring documentary film In the Eye of the Spiral. The film, now raising money on Indiegogo, features seven of Haiti’s most prominent living artists, among whom 2009 Nobel Prize candidate Frankétienne, and proposes a truly new narrative for Haiti – a long-embattled country steeped in vitality and built in no small part on the courageousness of the creative spirit.